Before enrolling, take the time to find out everything SPSAD has to offer. We want you to achieve your maximum potential, which is why we have invested in staff, strategies and infrastructure to make studying easier and more fun. Life at SPSAD is about having fun as well as studying hard. We are dedicated to providing you with the best experience possible. Our courses give you a taste of what it is like in 'the real world' with 25 per cent of learning undertaken in industry and community placements. Our Work Integrated Learning (WIL) program gives you the skills to hit the ground running once you graduate. Our great range of services and facilities will help you unwind during study breaks. With an extravagant campus, we bring SPSAD to you. 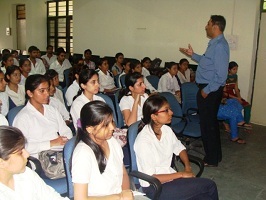 Our campuses are located in the heart of Rohtak City. Being close to the action means you'll enjoy the city and staying in the campus together. proper stress on the promoting the culture is given at SPSAD and for that we have many clubs like music club, drama club in which student becomes the member and they get the chance to exhibit what they have been working in front of a large crowd. We are renowned for our cultural diversity. With over 1200 students studying at our campus with different backgrounds, it's a great place to make friends with people from different places. Student work Our great facilities help our students work smarter and have fun while doing it. Student services From relaxation to advice and counseling, we can help you enjoy life at college.